Home/Dinosaur Fans, Everything Dinosaur Products, Main Page, Photos of Everything Dinosaur Products/Merci Pour Le Triceratops! At Everything Dinosaur, we really enjoy viewing the model collections of dinosaur fans. It is great to see what collectors and figure enthusiasts have made of their purchases and we get lots of pictures sent into us highlighting dinosaur displays, prehistoric animal dioramas and completed model kits. Recently, we received some photographs from a talented model maker who had just finished a Pegasus Hobbies Triceratops model kit and what a fantastic replica he has created. A completed 1:24 scale Pegasus Hobbies Triceratops dinosaur model. The Pegasus Hobbies Triceratops is one of trio of dinosaur model kits currently available from this manufacturer. The kit consists of a solid PVC Triceratops dinosaur in several constituent parts, a detailed display base and a name plate. 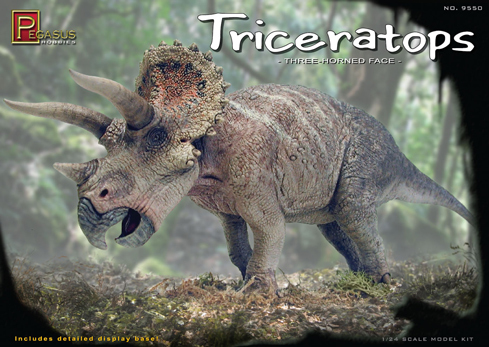 Model fans and collectors have a wonderful 1:24 scale Triceratops figure to assemble and paint. As the glue and paints are not included in the kits, the model maker has complete freedom to decide what colour scheme they would like. The very talented collector who sent in these pictures to Everything Dinosaur, has chosen to emphasise the subtle scales on the flank and to highlight the epocipitals on that awesome-looking head shield. Finished Triceratops dinosaur model kit. The finished model shows lots and lots of detail. The skull and the open mouth have been painted with considerable skill and care. 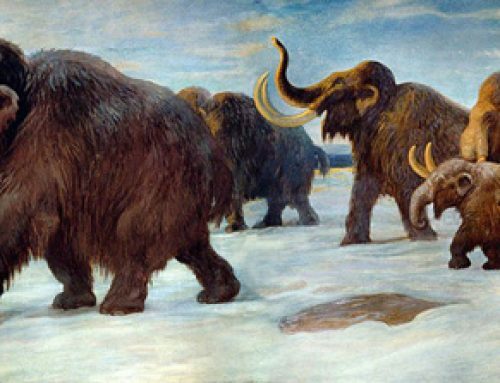 Note how even the individual digits and toes have been painted, there is certainly a lot to admire in this completed replica. The weathered look to those huge brow horns and the delicate brushwork that has enabled them to fit seamlessly into their bony sockets is particularly impressive. This is a wonderful example of the dinosaur model maker’s art. Pegasus Hobbies Triceratops 1:24 scale dinosaur model. The box art for this kit (shown above), depicts this horned dinosaur in a forest environment, but this model maker has chosen to paint the display base a sandy colour. Perhaps the Triceratops lived in an arid environment, or maybe the display base depicts the shore of a lake or a river bank. Could the Triceratops be at the seaside? Ironically, numerous Triceratops fossil specimens have been found in association with ancient coastal habitats. A completed 1:24 scale Pegasus Triceratops model. The Pegasus Hobbies kits have built up a strong reputation for their quality and craftsmanship, these kits really do give model makers the opportunity to develop their own unique interpretation of a famous animal from the fossil record.